The J's Racing Front Camber Joint S1 allows for additional front camber by shifting the camber range to 2°-5° of camber without roll center adjustment. By redesigning the previous model, the new camber joints have been enhanced with the roll center adjuster function in addition to the original negative camber adjustment. The front camber angle can be adjusted to the stock + 2 degree (+ 3 degree for S2). The front roll center value can be adjusted back to the correct one. The insufficient negative camber is always a problem for S2000. 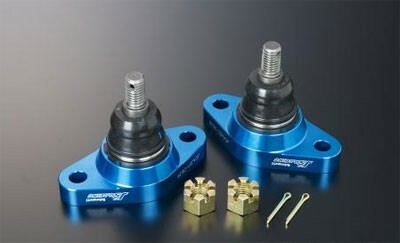 This product creates enough negative front camber by locating the lower ball joint at an eccentric angle from the center. * The stock bolts are to be reused or use new stock ones. Please apply the correct tightening torque. After the installment, it is necessary to properly adjust the ride height and alignment. It is highly recommended to check the tightening condition of the bolt & nut periodically.